Mehdizadeh Khalsaraei, M., Khodadosti, F. (2014). Nonstandard finite difference schemes for differential equations. Sahand Communications in Mathematical Analysis, 01(2), 47-54. Mohammad Mehdizadeh Khalsaraei; Fayyaz Khodadosti. "Nonstandard finite difference schemes for differential equations". Sahand Communications in Mathematical Analysis, 01, 2, 2014, 47-54. Mehdizadeh Khalsaraei, M., Khodadosti, F. (2014). 'Nonstandard finite difference schemes for differential equations', Sahand Communications in Mathematical Analysis, 01(2), pp. 47-54. Mehdizadeh Khalsaraei, M., Khodadosti, F. Nonstandard finite difference schemes for differential equations. 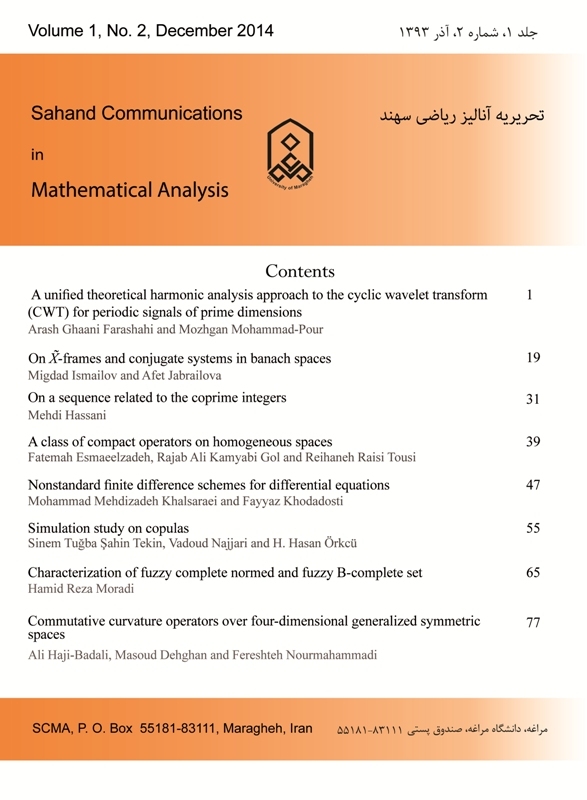 Sahand Communications in Mathematical Analysis, 2014; 01(2): 47-54. In this paper, the reorganization of the denominator of the discrete derivative and nonlocal approximation of nonlinear terms are used in the design of nonstandard finite difference schemes (NSFDs). Numerical examples confirming then efficiency of schemes, for some differential equations are provided. In order to illustrate the accuracy of the new NSFDs, the numerical results are compared with standard methods. R. E. Mickens, Applications of Nonstandard Finite Difference Schemes, World Scientific, Singapore, 2000. E. Hairer and G. Wanner, Solving ordinary differential equation II: Stiff and Differential-Algebraic problems, Springer, Berlin, 1996. L. C. Evans, Partial Differential Equations, AMS, Providence, 1998. F. Brauer and C. Castillo-Chavez, Mathematical Models in Population Biology and Epidemiology, Springer, New York, 2001. C. S. Holling, The functional response of predators to prey density and its role in mimicry and population regulation, Mem. Entomol. Soc. Canada., 45 (1965) 1-60. R. Anguelov and J. M. S. Lubuma, Contributions to the mathematics of the nonstandard finite difference method and applications, Numerical Methods for Partial Differential Equations, 17 (2001) 518-543. R. E. Mickens, Nonstandard Finite Difference Models of Differential Equations, World Scientific, Singapore, 1994.
and Applied Mathematics, 158 (2003) 19-30. H. Ramos, A non-standard explicit integration scheme for initial-value problems, Appl. Math. Comput., 189 (2007) 710-718. Ramos, Linearization techniques for singularly-perturbed initial-value problems of ordinary differential equations, Appl. Math. Comput., 163 (2005) 1143-1163.